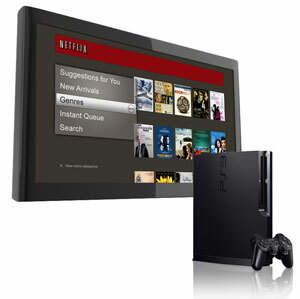 If you're looking for another excuse to buy a Sony PS3 ($299) for the holidays, the new version of Netflix may be it. The PS3 implementation of Netflix offers more features than almost any other connected device, with blazing speed when browsing for movies and controlling playback. And it finally ends the need for you to have a physical Netflix application disc to run Netflix on your PS3. The hyped functionality upgrades of the new Netflix include Dolby Digital Plus 5.1-channel surround sound and streaming of select movies in up to 1080p resolution. But that isn't where the excitement lies for me. What really makes the PS3 version of Netflix stand out is the terrific menu system that gives you the ability to search movies and TV shows by genre (comedies) or sub-genre (romantic comedies), with up to 250 movies displayed at each level (other products limit you to as few as 25). If you still can't find what you're looking for, the PS3 Netflix app lets you search for movies by title, not something you can do on many other products. The video below will give you a sense of the fluid and simple nature of the new interface design. And when browsing, I was blown away by how fast the PS3 responded. Scrolling menus was nearly instantaneous. And when I clicked on a movie to watch, it loaded very quickly and with less variance in video quality than other devices I've used. Even fast-forwarding and rewinding was significantly faster. Netflix subscriptions that offer unlimited streaming start at $8.99 a month, a bargain for avid movie watchers.